The solicitation for 'Leviathan' by John Layman and Nick Pitarra gives a lot away. "Ryan DeLuca didn't buy enough beer for his party, and while he was out on a beer run, his idiot buddies busted out some mystical arcana and performed a summoning ceremony-a ceremony that summoned a giant monster from hell!" But you have to see it to believe it. You are not ready for this level of awesomeness. Ryan's dilemma is a relatable one. You throw a small party with friends only to run out of beer when more unexpected guests arrive. An inconvenience for sure especially when you leave your guests with Goth Jimmy. Ryan and his buddy Johnny head down to pick up some more beer when all hell breaks loose. A giant explosion in the middle of the city gives way to a fiery Godzilla-like beast laying waste to people, cars, and buildings. It begins to rampage in Ryan's direction. All he can think of is his beloved Vivian who's still in his apartment. Layman gets us right into the action after a brief set-up. He wastes no time to unleash the Leviathan. This is why we picked up the comic, right? And unlike some disappointing Godzilla films that didn't embrace the mayhem of a monster soon enough making eager moviegoers wait for the destruction to start, Layman takes four pages to get the party started. At this point, Pitarra picks up the axe and begins to shred. With a larger-than-life premise, you need an artist that can deliver larger-than-life art and Pitarra brings the heat and action. He fills every panel on every page with intricate details from backgrounds to foregrounds. You have to linger on each page and take in every little line and image to fully understand the scope and magnitude of what Pitarra is doing. A rampaging monster comic should feel epic and cinematic. The art overwhelms the page and the eyes as it should. Combined with Michael Garland's bright varied colors, the action is kinetic and devastating. It's as chaotic and destructive as you'd expect when a monster is summoned from another dimension and wreaks havoc in a city. As far as the story goes, Layman establishes a thin and efficient plot to get the action going so character development isn't a priority but Ryan certainly loves Vivian and it shows. It comes across as an exciting schlocky monster movie you'd watch over and over at midnight showings. 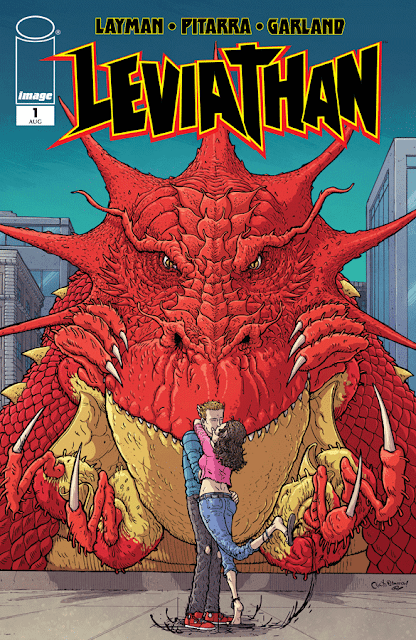 As a comic, 'Leviathan' is one you dive into and savor each panel for its intricacy and sheer lunacy. There's even a cameo by a public figure that is so wild it could actually be a true depiction. 'Leviathan' is a freaking blast.